If statistics (and those who report them) can be believed, we’re going to end up with little change in Parliament insofar as the Conservatives are concerned… but it’s going to be a victorious day for the NDP. Which wouldn’t make me too unhappy except that I don’t have particularly fond memories of the times when the NDP was governing Ontario. I was called by an NDP activist the other day, and mentioned this. He didn’t argue with my assessment, only mentioned that those were tough economic times. “Why, these aren’t?” asked I, to which he had no response. I have often expressed my opinion that the system of personal income tax is not only incomprehensibly complex and costly to administer, not only is it unfair, but it also represents an absolutely unreasonable intrusion by government into our personal lives. In my opinion, it should be abolished in favor of a value added sales tax which is easy to administer, which can be fair and reflective of social policy (e.g., through different tax tiers for different classes of goods) and would require no government intrusion at all into our existence. But I am just a lone nutcase, so who cares what I think? However, when it is a former secretary of the U. S. Treasury who advocates this very idea, perhaps people notice. I certainly noticed when Paul O’Neill made this very point talking to CNN’s Fareed Zakaria this morning. I used to think of myself as a moderate conservative. I didn’t much care for conservative ideology, but back in the 1980s, conservatives seemed to be much less burdened by ideology than their liberal counterparts, and more willing to make decisions based on facts. We have an election coming up here in Canada, and I cannot imagine voting for the Conservative party. It’s not that I dislike Harper. Hey, he’s a cat lover, and I am most certainly fond of cats. Nonetheless… he worries me. The way the Harper government undermined the de facto independence of Statistics Canada and placed ideology ahead of facts when they made the decision to scrap the mandatory long-form census is but one example. Having grown up in a communist country, I used to think that ideological blindness was a prerogative of the political left; now I know better. Proposals to rewrite Canada’s copyright law is another issue. Like the much criticized “Digital Millennium Copyright Act” of the United States, proposed law in Canada would also make it illegal to tamper with copy protection technology even when the planned use of the copyrighted work would itself be legal. Many don’t seem to understand that this formulation effectively turns a “limited monopoly” intellectual property right into an unlimited one: by using copy protection technology (even worthless, token technology will do), a copyright holder can prevent otherwise legal fair use. To be sure, I don’t necessarily expect a Liberal government to do better, but right now, it’s the Conservative proposals that I need to worry about, because they’re the ones edging ever closer to a parliamentary majority. Then there was the proroguing of parliament, not once but twice. Harper’s conservatives seem utmostly concerned about the traditions of our parliamentary democracy when they try to frighten us with the spectre of a liberal-led coalition government (which, incidentally, would be entirely legal and constitutional, and also representing the majority of Canadian voters) yet they seem to think that shutting down parliament is not a violation of the same traditions. I am all for upholding both the written and unwritten traditions of this great country, but that then also includes not shutting down parliament, or, for that matter, not messing with or muzzling our statistics office. One reason why I consider myself conservative is that I believe in fiscal conservativism: government being a “necessary evil”, it should be small, and the amounts it spends on programs, however worthy, should be constrained by the realities of available revenue and a desire to keep taxes low. Instead, Harper’s government delivered the biggest deficit in Canadian history. True, it was a result, in part, of an unprecedented recession, but only in part; they were well on their way towards sliding into the red long before the recession hit the Canadian economy. Having said that… I don’t think that Harper is evil incarnate or that his re-election means the end of Canada as we know it. This is a fortunate country, blessed with a decent political elite that you can respect even when you disagree with them. But I still wouldn’t feel comfortable with Harper in charge of a majority government. I sincerely hope that he does not win that majority on May 2. The parliament of Hungary approved a new constitution. Too bad that it’s a constitution designed the serve the interests of a single party and its predominantly Christian conservative ideology, as opposed to serving the interests of the nation by strengthening the system of democratic institutions, of checks and balances. And this time around, they can’t even blame foreign occupation as the cause… this wondrous piece of legalese wasn’t drafted in Vienna or Moscow or anywhere else. Here’s the story of a person, former US Air Force major Harold Hering, who dared to ask a simple question: if your hand rests on the launch key of a nuclear missile, and you receive a launch order, how do you know that the order is truly lawful? He had no answer, and he was discharged from the military for asking a Forbidden Question that went beyond his “need to know” in the reading of a US Air Force panel. But the question is as valid today as it was in the times of Nixon. Of course the fundamental conundrum is this: a sane society facing a nuclear opponent may rely on a nuclear deterrent to prevent attack, even though (being sane) it has no desire to respond to genocide with genocide if the unthinkable actually happens. So… how do you convince your enemies that you would launch a retaliatory strike even when in reality, you would prefer not to do so because killing millions of innocents on the opposing side will not bring your countrymen back to life? 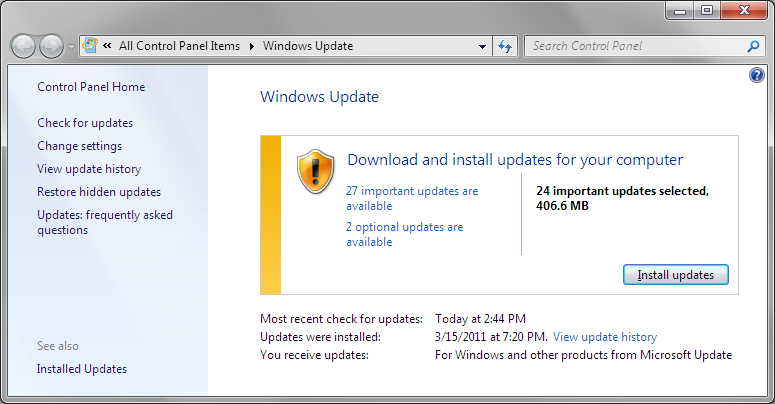 I knew there was going to be a larger than usual set of Microsoft updates this month, but this? Half a gigabyte worth of updates per machine? Fifty years ago today, Yuri Alekseyevich Gagarin flew into outer space, becoming the first human to orbit the Earth. I often wonder why it is so that fifty years later, space travel still remains an incredibly expensive novelty. After all, 50 years after the Wright brothers’ first flight, transoceanic air travel was a daily reality, and the jet era and mass air travel were just around the corner. But then, perhaps it is unfair to compare Gagarin’s flight to that of the Wright brothers. Perhaps it’s more like the Montgolfier brothers’ first manned flight in a balloon, in 1783. After all, a space capsule in an inertial orbit has a lot more in common with a balloon blown about by the wind than a modern, highly maneuverable airplane. So perhaps before space travel becomes routine for the masses, it is essential to make a technological leap similar to that between a primitive hot-air balloon and powered, heavier-than-air flight. As a footnote of sorts, the maiden flight of the Space Shuttle also occurred on this date, 30 years ago. Unfortunately, the Shuttle was far from being that necessary breakthrough. Its winged elegance notwithstanding, it’s still a chemically powered rocket, and chemical propulsion is just not sufficient… space flight will never become routine if you need 3000 tons of propellant to put a 100-ton payload into orbit. Or, it may yet turn out to be nothing, a modeling artifact that will eventually go away after further analysis. 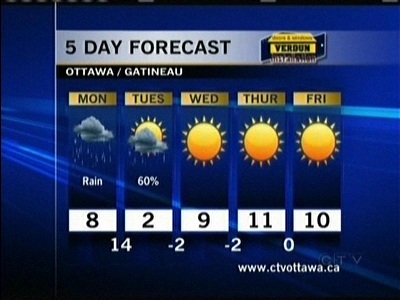 So how can the daily high be 8 degrees centigrade; the low overnight, 14; and the daily high the next day, 2 degrees? Must be global warming. Or Fukushima. Or Muslims. Whatever. I am listening to the Classical stream of CBC radio, and the music selection is very good. It is also utterly soulless. You see, radio without presenters is no radio at all. I miss the likes of Jurgen Gothe who’d tell me something about the music. Why it was composed. When it was composed and where. Something about the composer, and why this particular piece was chosen to be played tonight. For instance, right now I am listening to the 1st movement of Bax-Arnold’s Concertante. Back in the good ole’ days, Jurgen Gothe would have told me who this Bax-Arnold was. Yes, I can use Wikipedia and find out that “Bax-Arnold” is really English composer Sir Arnold Edward Trevor Bax, and that he wrote several pieces titled Concertante between 1918 and 1949, and thanks to Google and the disk number provided by the CBC, I can even figure out which of these is being played (it’s the Concertante for Piano Left Hand) but Internet searches are no substitute for the warm, friendly voice of a radio host who would tell me all this and more, anecdotes, back story, or completely irrelevant trivia about Ashley Wass on the piano, conductor James Judd, or perhaps the Bournemouth Symphony Orchestra and its relationship, if any, to the Bayview Retirement Home in Bournemouth in the British sitcom Waiting for God. The music now changed. CBC now informs me that I am listening to the 3rd movement, Marche Funebre, by a composer named “Not Found”. Whatever happened to poor Chopin that a national radio station can no longer find his name? Not to mention that unlike this sterile Classical stream (really just an endless playlist with an incomplete tombstone database), CBC Radio 2 wasn’t purely classical. Jurgen Gothe in particular had an eclectic selection of classical and modern, pop and jazz, Canadian folk music, and more. He was always full of surprises. The changes made to CBC Radio 2 just drastically narrowed the station’s scope for much of the broadcast day, because now, the richest musical genre of all (really, a collection of many genres) is simply excluded. No wonder I nowadays listen to BBC 3 more than the CBC.